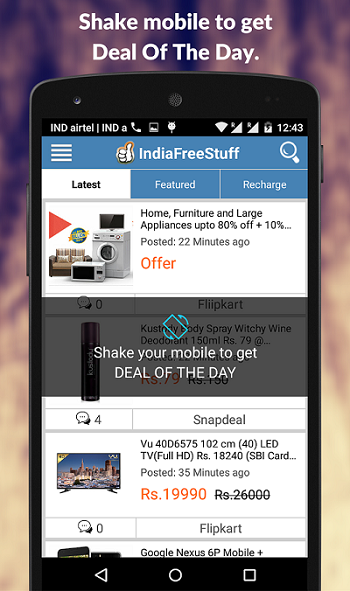 IFS App is one stop destination for Amazon Offers, Flipkart Deals, Amazon Diwali Sale, Gosf, Snapdeal Sale, Ebay Exclusive Coupons and Offers, Foodpanda coupons, Grofers coupons, PayTm Mobile Recharge & Bus Ticket Booking Promo codes.India Free Stuff Offers Best Deals Online, Discount Coupons ,Freebies...the best stuff to do, see, eat and buy covering majority of the places all over India and also few around the globe. 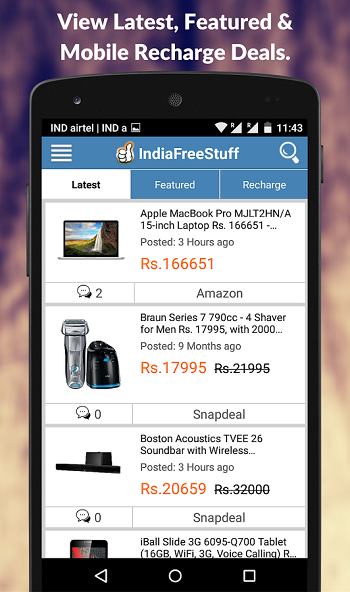 Download the IndiaFreeStuff application to start saving on everything you are looking for...across the country. Whether you are shopping for the latest fashion trends,craving for a cheap dinner or lunch in town ,or spending work meetings daydreaming about travelling to your favourite destinations,a daily replenishment of deals all discounts you like. Every Deal or Coupons or Freebies is available to use immediately,so you're never more than a few taps away from viewing your favourite deal to your favorite restaurant or grabbing your handy cam at amazing discounts. Q: Does the IFS app work with any version of Android? A: You'll need Android OS 2.3 or a later version to use this app. Q: How can I update the application? Q: How do I log in to the app? 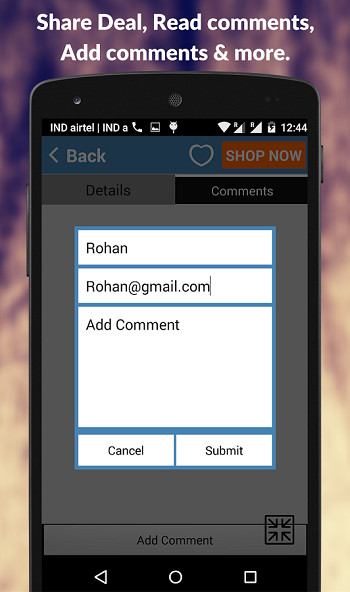 A: You'll be asked to log in with your username and password at first startup of app. You can also access the login window from the side drawer. Q: Why don't I get notifications? A: To ensure the prompt delivery of IFS app notifications, please check that you have a good Internet connection and your phone Sound & notification settings is configured properly. You have hibernate or freeze IFS app. Your phone connection is unstable. In Some rarely cases problem with IFS server. Q: No push notification for new deal.? 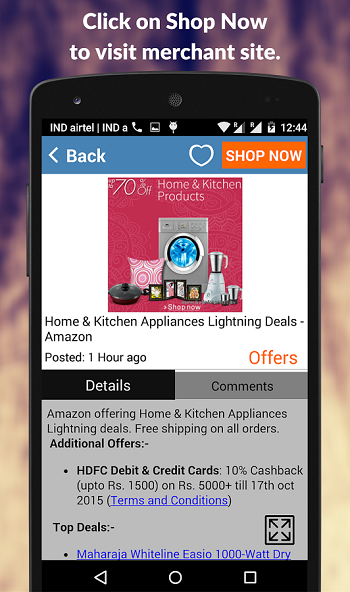 A: Push notification only for very hot deal, otherwise people will get annoyed by seeing lot of notification. Q: Multiple notification for 1 deal, sometime I got 20 notification for same deal, and they fall continuously? A: We suggest you to update the app from playstore. If already updated try deleting data/cache and reinstalling the app this should fix the problem. Q: App not working. Stuck at Loading screen …? A: Please check your network connection, try deleting data/cache and reinstalling the app. if problem still exist feel free to report here with proper bugs report format. Q: Why is the app slow for me? A: Be sure you have a good network connection. We are working to optimize performance of our app with each version we release. Q: Can I manage my account from the app? A: No, in order to change your password, email address, or any other information, you need to log in to your http://indiafreestuff.in account from your computer, or via an Internet browser on your Android device. Q: Can I share a deal from the app? A: Yes, tap the share button at the top corner of the deal window, and you will get a list of apps you can share a course via. Q: What is Shake to Deal Of the day? 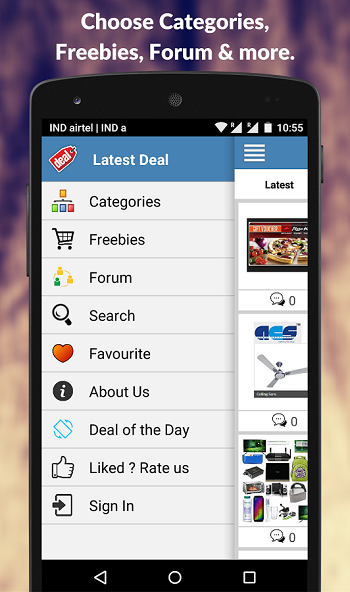 A: Shake to Deal Of the day is a feature to get exclusive deal of the day, everyday we select one best deal from all superdeals that we called "DOD (Deal Of the day)". Q: How do I refresh the Deals? 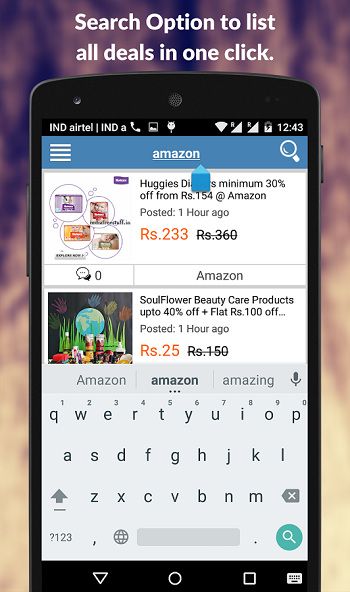 A: You can now refresh content in the app by using the familiar pull-to-refresh gesture. Just swipe down on any screen in the app and you'll get the freshest content available for that screen. Q: Is there an IFS app available for iPhone, Blackberry, Windows Phone or other phone platforms? A: Sorry but due to lack of resources and developer currently IFS app only available for android but soon in future we will try to make app for Windows and iOS. 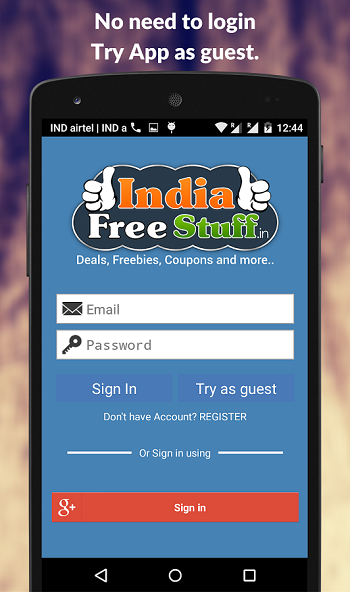 If you don't have android, you can use IFS by visiting the http://indiafreestuff.in website from any mobile device. Q: Are there plans for future releases? A: Yes. We've got some great things in the works. As always, we'd love to hear your ideas and serve you best. Please give us some time and your valuable feedback to improve our app. Q: I would like to suggest feature for upcoming version and bugs report in current built? A: Great! You can do so by clicking the 'Like? Rate us' button located from the menu sidebar. To open the sidebar, from your IFS app swipe your finger across the screen from the left edge to the right. You can submit suggestion and bugs report by leaving feedback in play store or by replying in this thread. we really appreciate it and we will try our best to solve bugs and implement your suggestion in future update of App. Please provide as much detail as possible so we can best assist you, So tell us what you like and what could be better. Some lucky valuable feedback users will get IFS points and other freebies as reward. 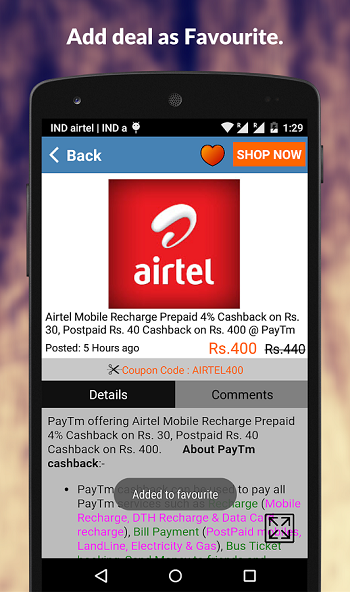 Refer and earn se Kitna points Milega?? admin please have login via facebook option. Sure, we will add in upcoming version. kindly add one back option . when we open forum through app. after that when ever we want to go to previous page back option is neede. if u do back through mobile it brings us directly on fp. Please introduce it asap as i always login via facebok in desktop site also.. Please introduce it within 1-2 days. It will be done in next update soon. When is the next update coming??? 1 month 3 month 6 month or 1 yr or 2 yr????? @Admin when is the next version of app & website COMING???????????????????????????????????????? In App we facing some issue with API, developer still working on that. It may be fixed any time but we expect it to done with in 7-10 days. when i'm doing log in error occur of "something went wrong please try again later". why?